In the Cape Verde Archipelago, the climate is very unusual, in fact, it is tropical arid, with temperatures generally not too high despite the latitude. This happens both because of a cool sea current and because of the trade winds, which steadily blow from the northeast, especially from November to May. The islands are divided into two groups: in the north, the Barlavento or Windward Islands (Santo Antão, São Vicente, Santa Luzia, São Nicolau, Ilha do Sal, Boa Vista), which have a more arid climate, and in the south, the Sotavento or Leeward Islands (Maio, Santiago, Fogo, Brava), which are a bit more rainy. The Barlavento Islands to the north are definitely desert, since they receive less than 100 millimeters (4 inches) of rain per year, while the southern islands receive between 200 and 300 mm (8 and 12 in) of rain, so their climate is semi-desert. In both groups of islands, in lowland areas and along the coasts, there are rare rains concentrated in the period from August to October (and sometimes also in July), which is also the warmest time of the year. The rains are quite irregular, which means that during certain years, the rains are very scarce or absent, while during other years, there may be heavy rainfall, usually concentrated in a few days (or even just one), which may result in landslides and flooding, also because of the scarcity of vegetation, as occurred for example in September 2012 in Sal and Boa Vista. As for the temperature in Cape Verde, there is a hot and muggy period from July to November, and a more temperate and dry period from December to June, during which the north-east trade winds constantly blow. During the coolest season, from January to March, daytime temperatures are around 22/23 °C (72/73 °F) on the Barlavento islands and around 25 °C (77 °F) on the Sotavento islands, while night minima are a few degrees lower, around 18 °C (64 °F) in the north and 19/20 °C (66/68 °F) in the south. In Cape Verde, the weather is rarely very hot, however, the temperature can sometimes reach 35/37 °C (95/99 °F) from May to October, when the wind blows from the African continent. The north-east trade winds begin to blow in November and gradually lower the temperature; the wind attracts fans of windsurfing and kitesurfing especially on the eastern islands (Santa Maria, Boa Vista), from November to May. Sometimes, weather conditions change and the trade winds are replaced by the Harmattan, a dry wind that blows from the Saharan desert, and can bring dust and sand storms, reducing visibility and hampering human activities. Even during the dry period, from December to June, on the northern slopes of hills and mountains, a bit of cloudiness can form, and a bit of rain or drizzle can fall. In fact, Cape Verde is a volcanic archipelago, and in some of them, we find mountains, the highest of which is Pico de Fogo, 2,829 meters (9,282 feet) high, on the island of Fogo: on the northern slopes of the island, there is even a bit of greenery. On the island of Santiago, where Praia is located, we find Pico da Antónia, 1,394 meters (4,573 feet), while in Santo Antao, we find Topo da Coroa, 1,979 meters (6,493 feet), and Pico da Cruz, 1,585 meters (5,200 feet), and finally, in São Nicolau, we find Monte Gordo, 1,312 meters (4,304 feet). As we mentioned, the northern islands (Santo Antão, São Vicente, Santa Luzia, São Nicolau, Ilha do Sal, Boa Vista) are a little cooler and more arid than the southern ones. 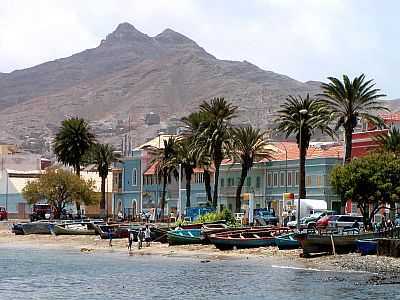 In Mindelo, on the northern (Barlavento) island of São Vicente, only 97 mm (3.8 in) of rain fall per year, with a maximum of 45 mm (1.8 in) in September. Here is the average precipitation. Here are the average temperatures of Mindelo. On the northern islands, the sea is warm in summer, while it becomes a bit cool in the winter months, when it drops to 22 °C (72 °F). The southern islands (Maio, Santiago, Fogo, Brava) are slightly warmer, as we can see from the temperatures of the capital, Praia, located on the island of Santiago. In Praia, located on the Sotavento Islands, ie the rainiest ones, 250 mm (10 in) of rain fall per year, of which 95 mm (3.7 in) fall in August and 115 mm (4.5 in) in September. Here is the average precipitation. The amount of sunshine in Cape Verde is high all year round, but it's slightly better between March and June. Between July and early October, ie the warmest and relatively rainy period, the sky may be cloudy for longer or shorter periods. In Praia, between July and September, the amount of sunshine drops to 6/7 hours per day, while on the northern islands, less affected by cloud banks, it remains a little higher (7/8 hours). Here are the average sunshine hours per day in Praia. The temperature of the sea in Praia is high in summer, while it becomes a bit cool in winter, but still acceptable for swimming, as can be seen in the following table. In the ocean to the south of Cape Verde, we find the area where hurricanes, the tropical cyclones of the Atlantic, start to form; after they are formed, they move towards the west or the northwest and head to the Caribbean. Some of them can brush the islands of Cape Verde, or they can directly hit them, especially the southern ones, although when they hit them, they are usually still in the stage of tropical depression, and typically reach hurricane intensity when they are in the open ocean. However, the period when Cape Verde has been affected by tropical depressions and cyclones in the past goes from early August to September 20 (once, it also occurred in early October), with a maximum from August 25 to September 15. Since they have a good climate, in theory, you can visit Cape Verde throughout the year, but it is necessary to make some clarifications. Lively breezes often blow, giving a feeling of cool in the winter months, especially during the days when the temperature is lower, and those who are sensitive to cold could need a jacket; moreover, the brisk wind can make the sea rough. This mainly occurs from January to March, and more often on the Barlavento than on the Sotavento islands. In winter, the Sotavento islands are therefore preferable. Although there is often little rain even in the period that is in theory the wettest, from August (and sometimes July) to October, during which it might not rain for weeks, occasionally, there can be torrential rainfall, though short-lived, so this period can be avoided for safety. In addition, in this period, the sky is often cloudy, especially on the Sotavento islands. In August and September, the Barlavento islands are therefore preferable (also because of the lower risk of hurricanes). So, all in all, you can choose the months of May, June, the first half of July, and November. At noon, the sun is directly overhead twice a year, in late April and in mid-August, and it remains high in the sky from April to September: care must be taken to avoid sunburn, since cool breezes can prevent you from perceiving the intensity of the sun's rays. In winter: bring light clothing, but also a light scarf for the wind, a sweatshirt or sweater, and a light jacket for the evening. When going to the mountains, bring sunscreen, hiking shoes, and a sweatshirt and a jacket for the evening; a warm jacket and a beanie for Pico de Fogo. In summer: bring summer clothes, a light sweatshirt for the evening, comfortable shoes for excursions, and possibly a light raincoat in August and September. When going to the mountains, bring sunscreen, hiking shoes, and a sweatshirt and a light jacket for Pico de Fogo.